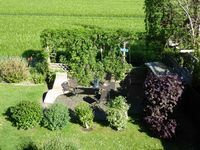 Properties in Drensteinfurt Rinkerode Station average 4.5 out of 5 stars. Insider tip in Münsterland - 5 star holiday apartment in style! Property 2: Insider tip in Münsterland - 5 star holiday apartment in style! Property 9: Rest and relaxation in the heart of nature. Just 100 meters from the lake. Year 2015 unique holiday feeling Pets !! Property 12: Year 2015 unique holiday feeling Pets !! Living in nature in the log house near Münster! Property 37: Living in nature in the log house near Münster! 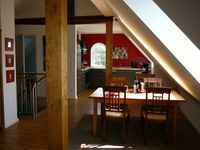 Property 41: Apartment "On the Quellberg"
The apartment is absolutely gorgeous and meticulous inside and out! We were warmly welcomed with treats and all kinds of information about the area--it was an easy, quick drive into M&uuml;nster and was a great home-base for our day trips! The whole apartment is excellently furnished--the kitchen and bath had everything we needed (and more!) for a great stay. City people (like us), be sure to consider that the property is on a working farm--with all it's charms (mosquitos and &quot;country air')--and that only a few of the windows had screens, which was a little uncomfortable because of the uncharacteristically hot summer (we purchased a small fan that connected to our laptop and bug spray--which took care of it all). We were about 10days there.